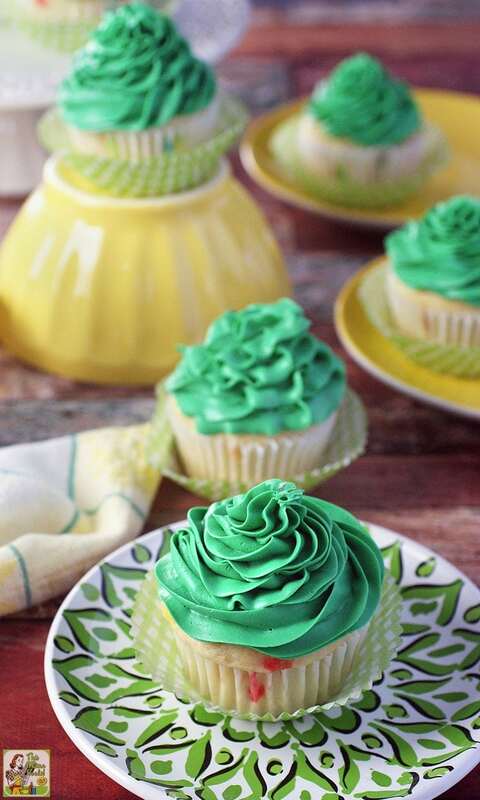 If you’re looking for easy, gluten free St Patricks Day cupcake recipes with a twist, you’ll love these St. Patrick’s Day Pot of Gold Filled Cupcakes. They come with a surprise inside – check it out! It’s no fun to feel left out! 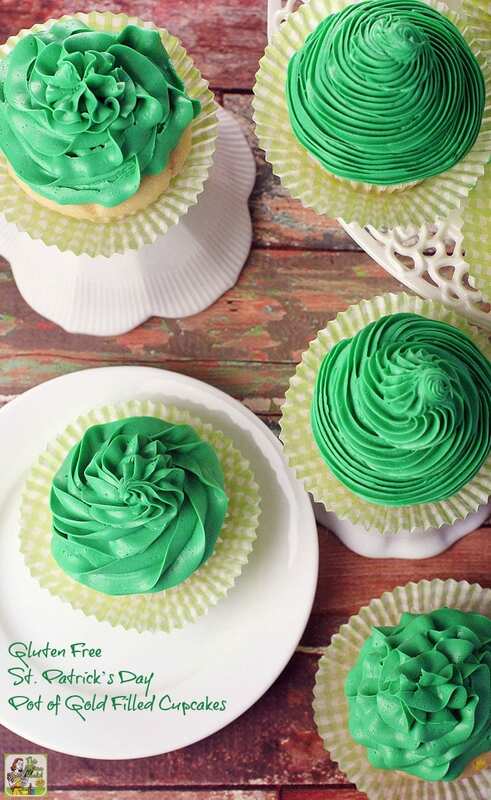 That’s why I’ve created a gluten free and somewhat guilt free St Patrick Day dessert recipe – Gluten Free St. Patrick’s Day Pot of Gold Filled Cupcakes. Why Gluten Free St. Patrick’s Day Pot of Gold Filled Cupcakes? We all know the story about the pot of gold at the end of the rainbow, right? In Irish folklore, fairies put a pot of gold at the end of each rainbow with leprechauns guarding it. That’s why you see so many rainbows and leprechauns on St. Patrick’s Day. I took inspiration from the pot of gold story, and came up with easy to make green gold filled cupcake for St Patrick Day. So how can you make cupcakes “gold filled” but keep them somewhat healthy (or a bit guilt free), too? By using my Easy & Healthy Apple Pie Filling recipe that’s low in sugar! 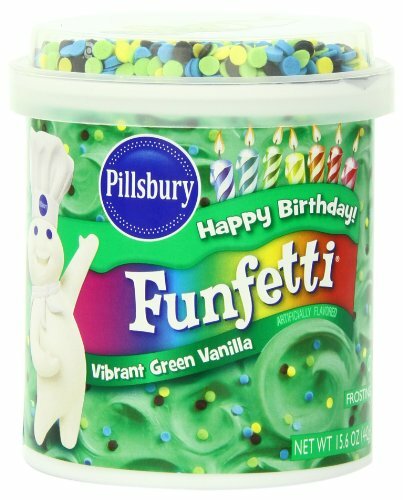 To make these St Patrick Day cupcakes even easier, I used Pillsbury Funfetti Gluten Free Premium Cake & Cupcake Mix and Pillsbury Funfetti Vibrant Green Vanilla Frosting. (The frosting is marked gluten free on the can.) 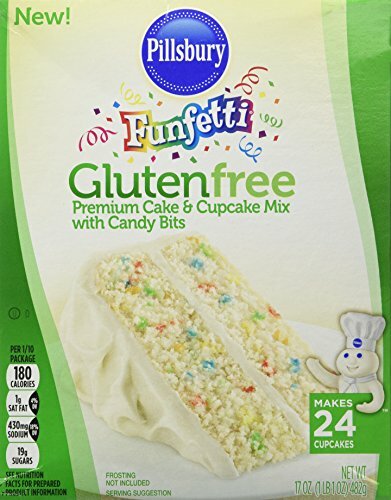 For more information about Pillsbury’s gluten free products, go to their website. 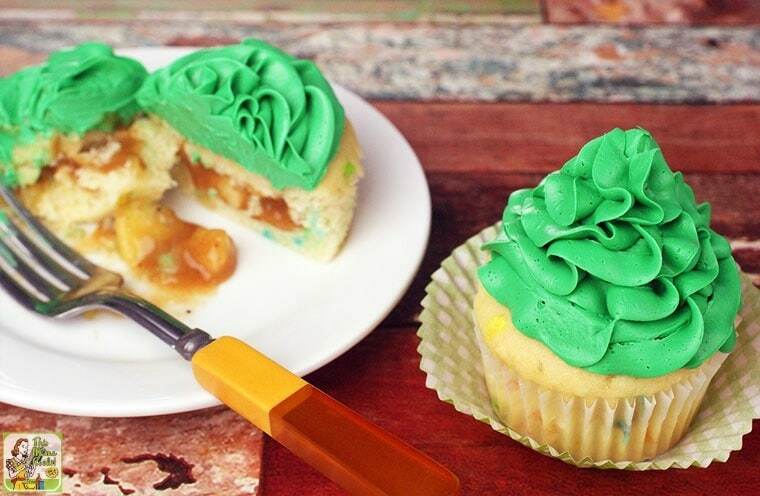 You don’t need a magic leprechaun to help you fill these St Patrick cupcakes with apple pie filling. 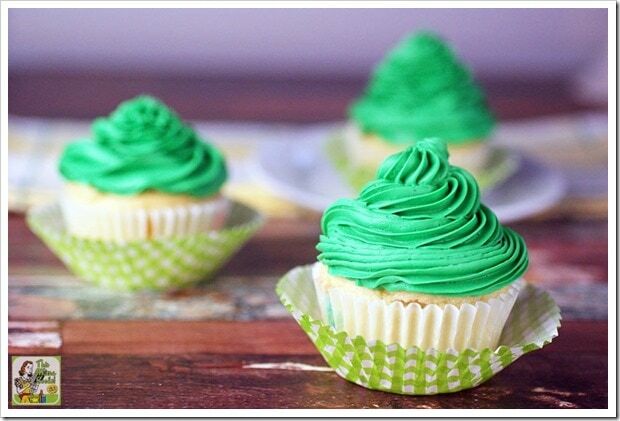 Instead, use this easy to do trick – first, you bake the St Patrick Day cupcakes, and after they cool, you fill them! 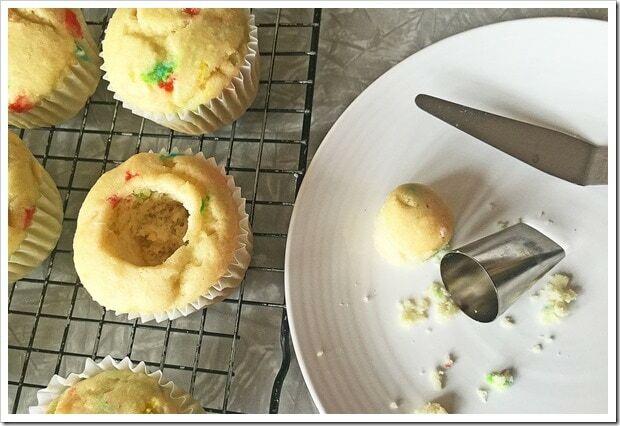 Taking a small cookie cutter, core out the center of the cupcake. (I used the end of a large pastry frosting tip.) Remove the core from what you used to cut it, and compact it a bit. This will serve as the lid after you fill the center of the cupcake. Press down the inside of the cupcake give you enough room to fill it with 1 tablespoon of apple pie filling. After filling, place the lid over the hole. Done! You now have a filled St. Patrick cupcake ready for frosting. No one will know it’s filled with yummy apple pie filling (the pot of gold!) until they bite into it. Frosting Tip: I find that Pillsbury Funfetti Frosting is a bit thin for piping compared to the frosting I make from scratch using powdered sugar and shortening. If you’re used to a stiffer frosting for piping, place the can in the refrigerator for a couple of hours. This will help make it feel a bit thicker. St. Patrick’s Day isn’t the only holiday day you can use this gluten free pot of gold apple pie filled cupcake. You can also use this filled cupcake technique will your favorite muffin recipe! Heat oven to 350 degrees F. Line muffin tin with paper baking cup liners to make 24 regular-size cupcakes. Make cupcake batter as directed on the box. 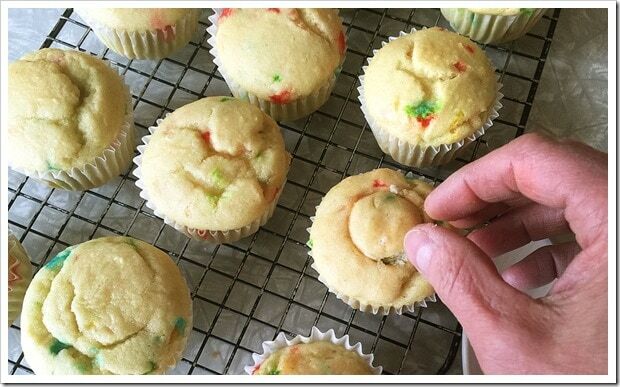 Fill each muffin cup half full with 3 tablespoons batter. Bake 19-23 minutes or until toothpick inserted in the center comes out clean. Cool cupcakes in pans 10 minutes. Then transfer cupcakes to a cooling rack to cool for 30 minutes. Taking a small round cookie or canape cutter, core out the center of the cupcake. Remove the core from the cutter, and compact it a bit. This will serve as the lid after you fill the center of the cupcake. 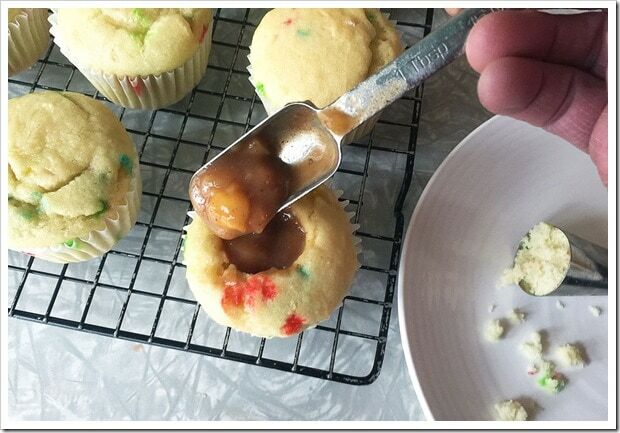 Press down the inside of the cupcake give you enough room to spoon in 1 tablespoon of apple pie filling. After filling, place the lid over the hole. Transfer the frosting to frosting piping bag fitted with large star tip. Pipe the frosting in a circular pattern on tops of cupcakes. Or you can frost cupcakes with an offset spatula instead. Originally posted on March 3, 2016. Updated with new information.